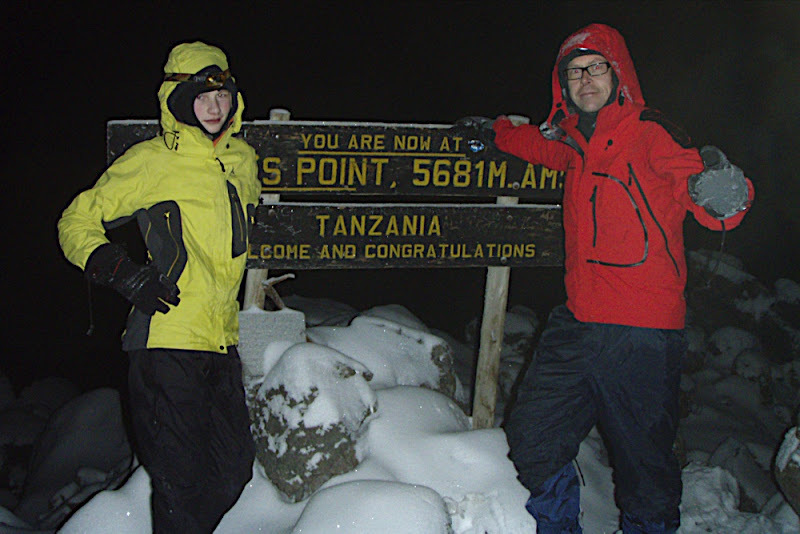 The end result was not that my son Alexander and I stood at Gilman's Point, 5681 m above sea level. 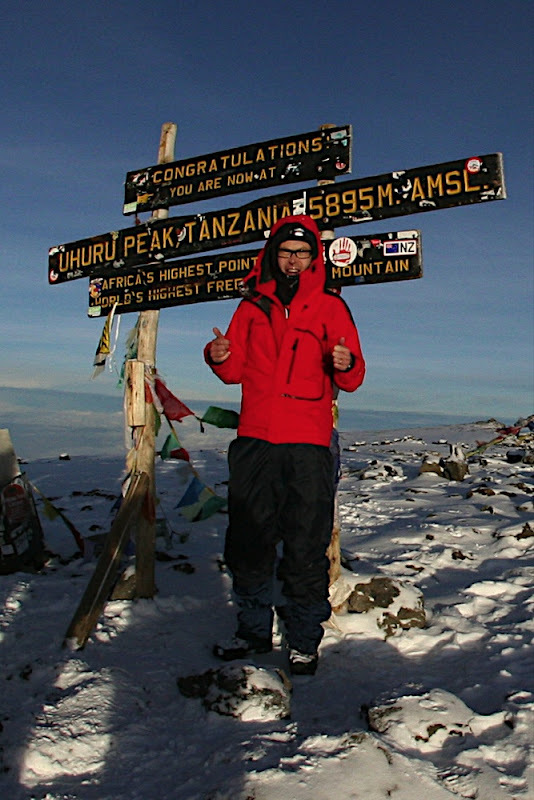 Nor was the end result that I stood at Uhuru Peak, 5895 m above sea level, and one of the world's Seven Summits. Sure, both of those experiences were unforgettable, and they were also personal quarterly goals that I had explicitly stated for myself, as I have described in my New Year's Resolution. The end result was a resetting of my brain. "So there's not much left, then", you may think -- and you may be right. Still, camping, trekking, walking and climbing for six days and nights gave the feeling of a mental cleansing operation. Asanti for the good food, Dolla! It may well be that I am too lazy to translate any of the blogs into multiple languages. So here goes the blog entry that describes the trip from a general tourist's perspective, in English! We started the trip at Rongai Gate, 2200 m above sea level. 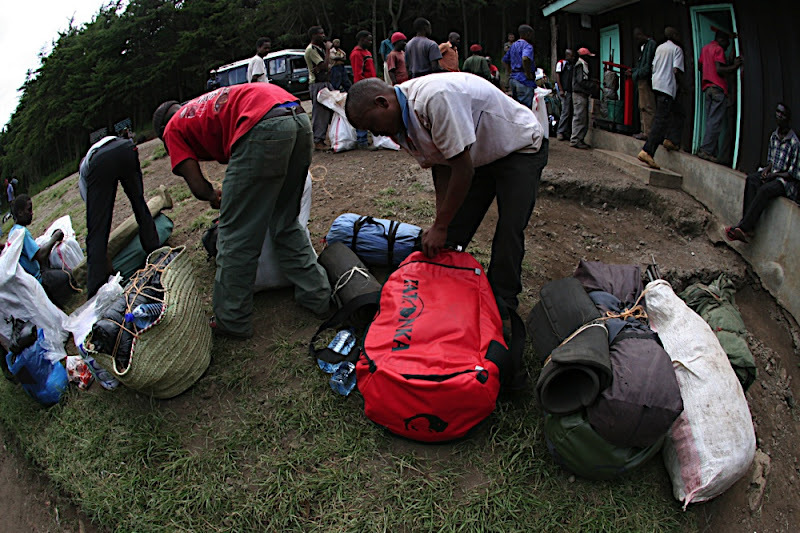 The porters weighed our luggage; no porter should carry more than 20 kg. The pine forest looked almost as at home in Finland. 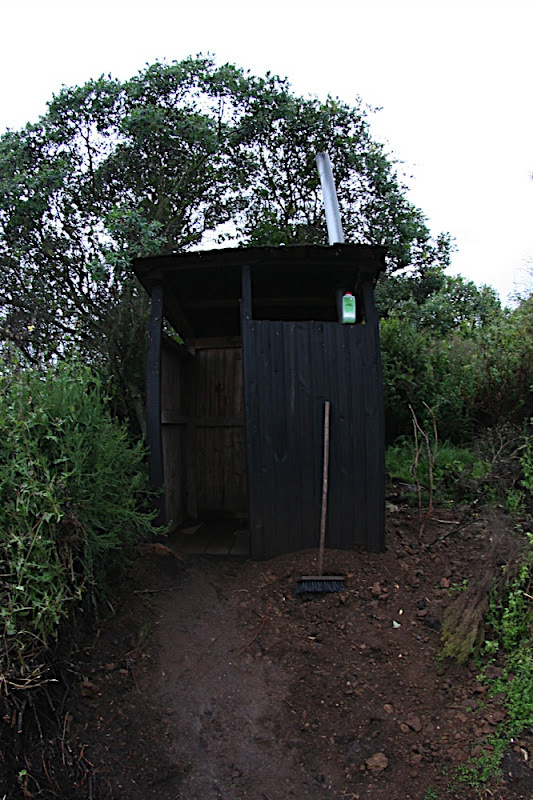 The outhouse style toilets, in Kilimanjaro dubbed "Internet Café", most definitely did not look like at home in Finland. 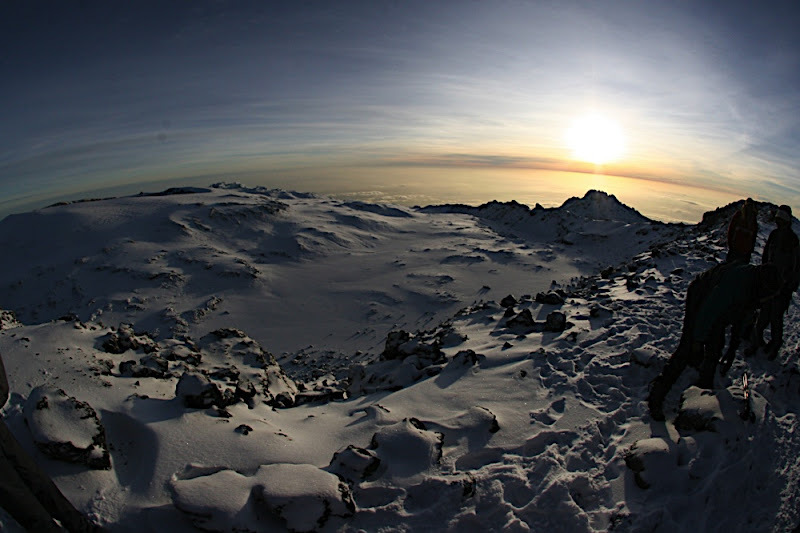 We formed a tiny group of three people climbing the Kilimanjaro with the German Alpine Association DAV Summit Club. The third person was Luidger from Gelsenkirchen. The planted pine trees near Rongai (pronounced Wrong Guy, with the emphasis on "guy") gate had long needless. This is the usual view on a trek: The shoes of the person in front. In my case, luckily, my son Alexander. 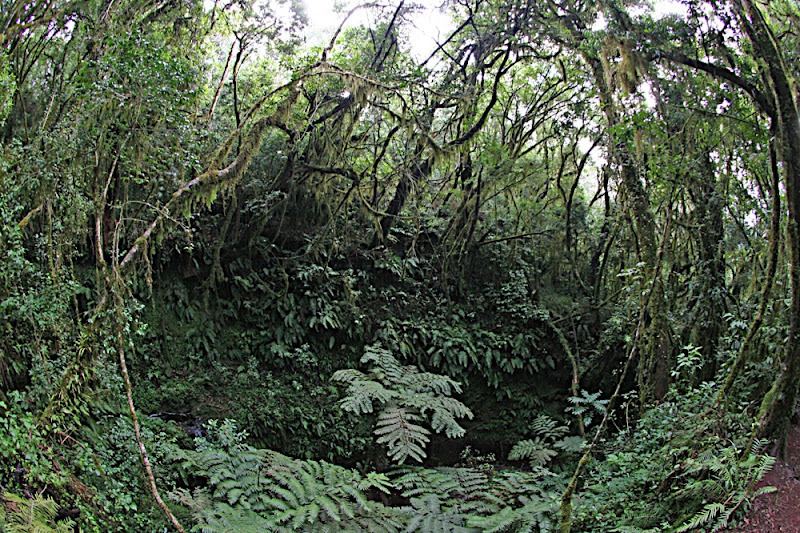 If you look really closely, you'll see a white-tailed monkey in this picture of the rainforest. We stayed in this Fjällräven tent also at subzero temperatures. 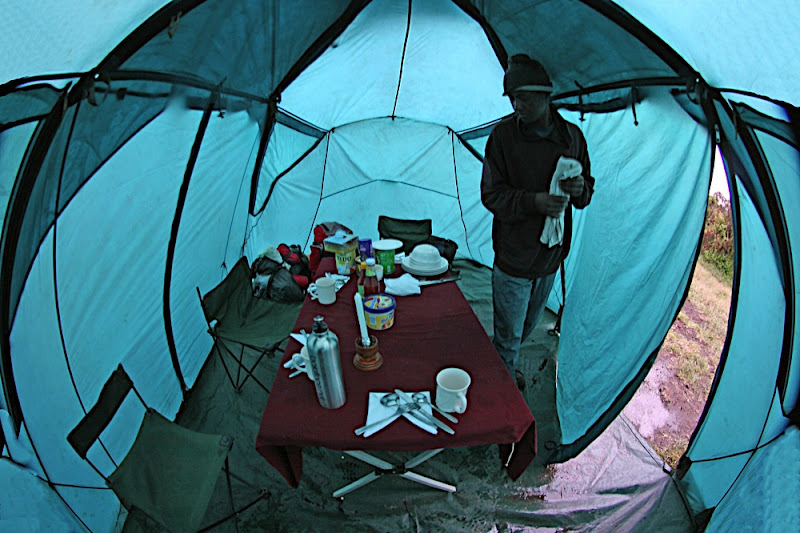 As it rained at some point nearly every day, it was good to be able to eat "indoors" in this tent. "Internet Cafés" could be found very often. I feared I would receive emails with attachments too often, but luckily, I didn't. 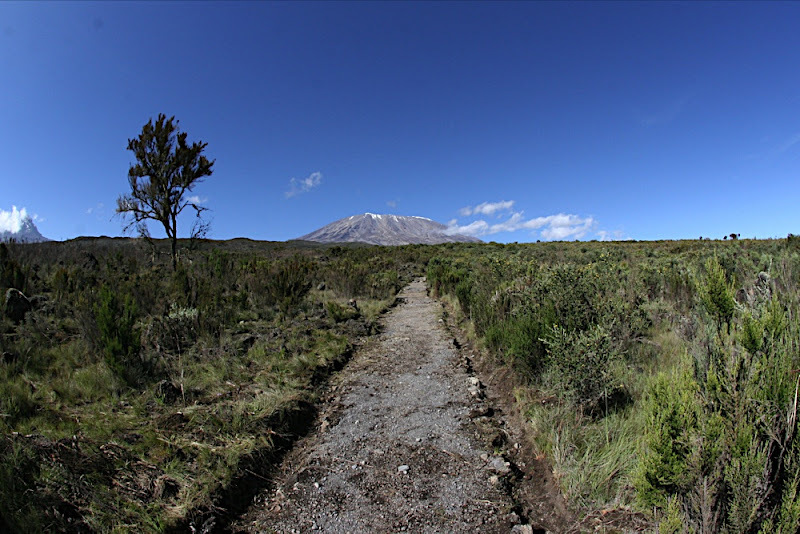 On the second day of walking, from Simba Camp to Third Cave, we got our first glimpse of Kilimanjaro. The vegetation changed and became more sparse. We had lunch break at Second Cave. At Third Cave, there was plenty of space. 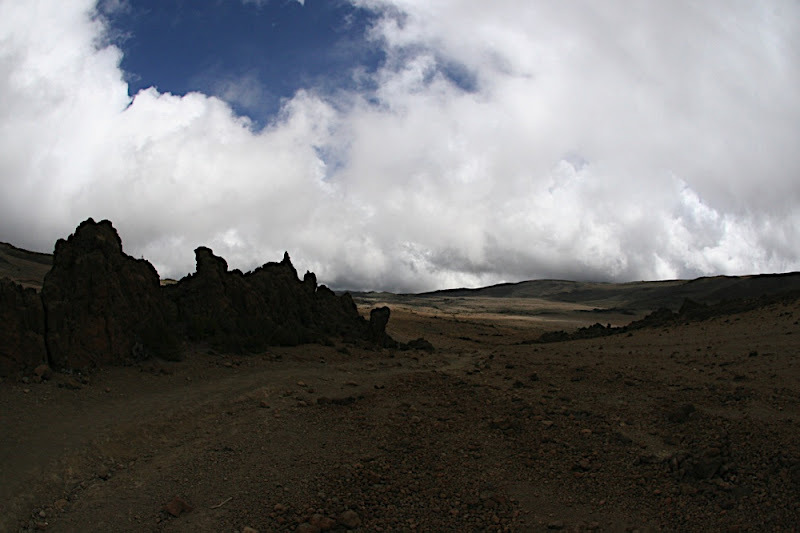 And here we stayed two nights, to get acclimatised at 3800 m.
Not much vegetation is left at this altitude. The third day, we went up from 3800 m to 4400 m and came back. That altitude had nearly just a stone desert. Not that you can see it on this picture of a break at 4200 m, but just before this picture was taken, we saw buffalo footprints (they come here to enjoy licking minerals, something buffaloes can't say no to). There were landscapes that looked as if the Voyager could land in them anytime. 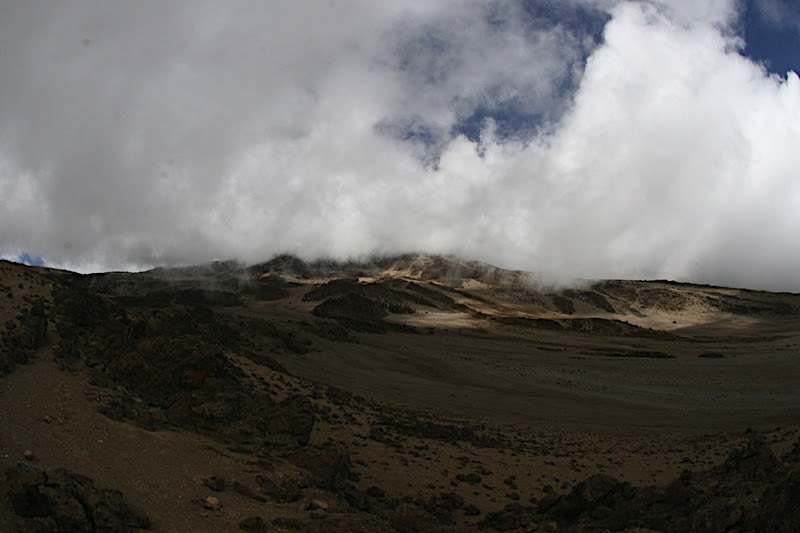 The fourth day, we walked up from 3800 m (Third Cave) to 4700 m (Kibo Hut). We didn't stay in the hut, but in our tents. 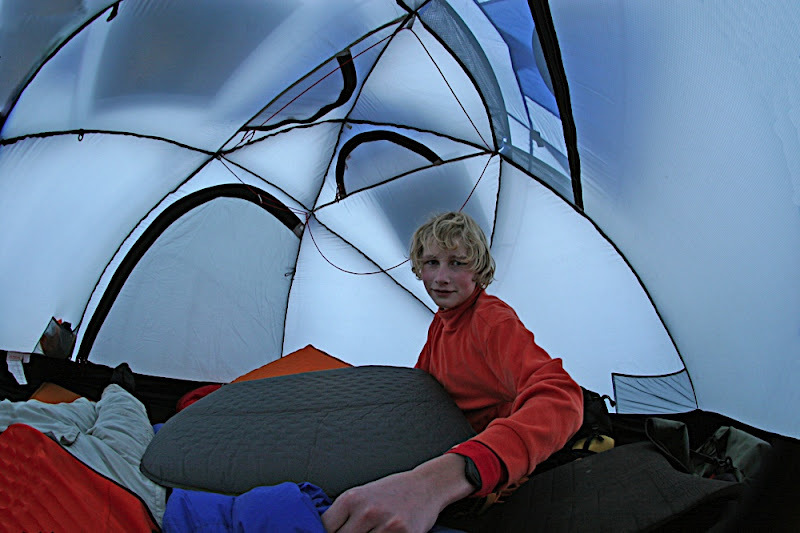 Staying in tents at temperatures well below freezing wasn't all that cold. The fifth day was summit day, and it actually started with a wake-up call att 22:50 the previous evening. Here is Alexander finishing his porridge, already dressed for the ascent. We believed we wouldn't even be allowed to climb, as there was a strong thunderstorm. But it didn't rain. Instead, it snowed. And at the beginning, it wasn't all that many degrees below freezing. After this night, the uppermost 1200 m were all covered in white snow. 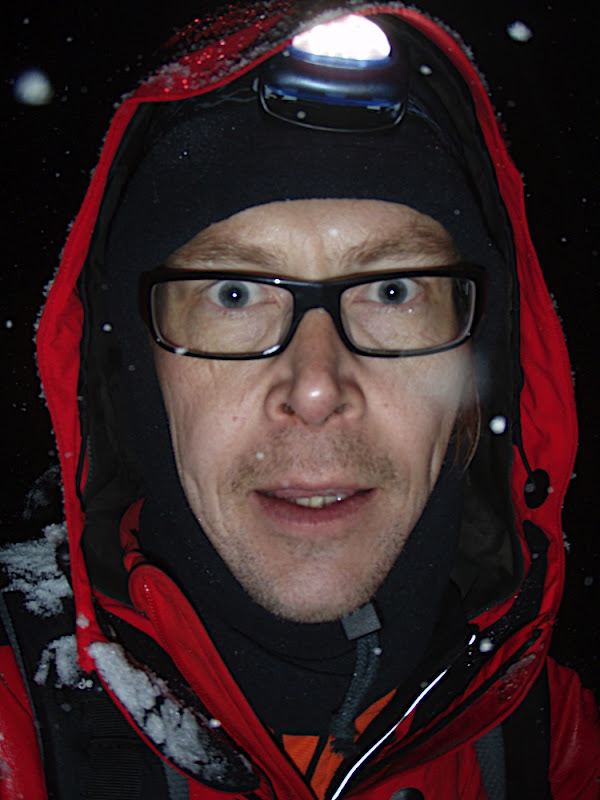 I can tell you it is a bit boring to climb for six hours in total darkness, just using a headlamp. Alexander got a severe headache and vomited several times. 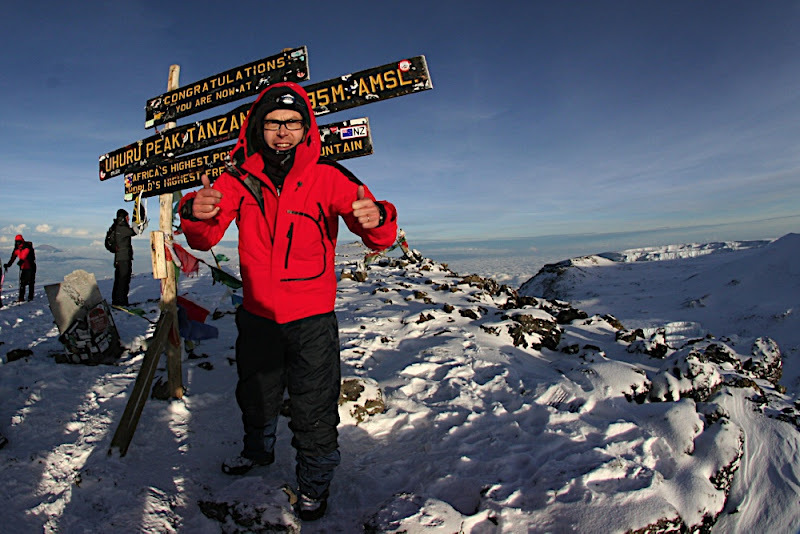 He still made it all the way to the crater rim of Kilimanjaro. At that point, you're "on top" of the mountain, and many climbers return. So did Alexander. Finally, the sun gets up. Here's the caldera, i.e. 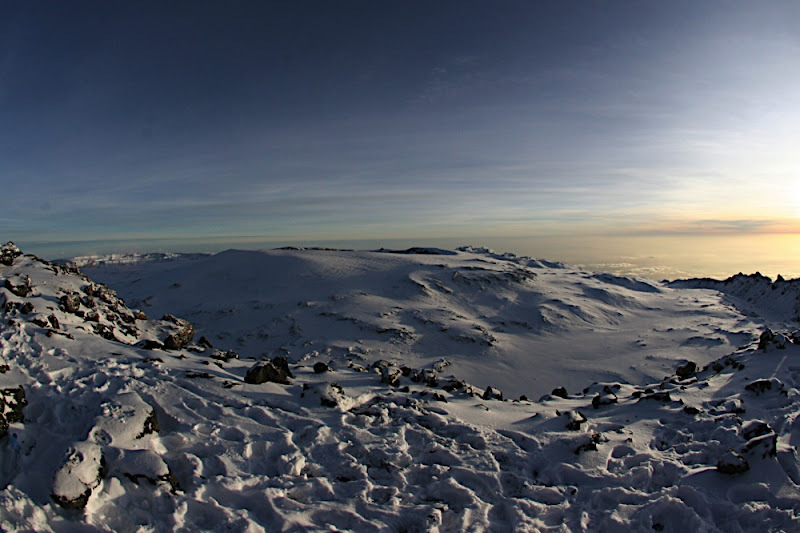 the inside of the Kilimanjaro crater. My own subjective feeling here was not about being tired, or cold. It was about being out of breath. I breathed, in and out, in less than a second during the steeper ascents at close to 6000 m.
This is the classic picture one is supposed to have. And yes, my hands were freezing. I had taken the previous pictures with my heavy Canon 20D and its 8 mm lens. Don't you agree it's a good idea to have a backup picture of important motives? This glacier is supposed to have melted away within 20 years. Day six was the final day. 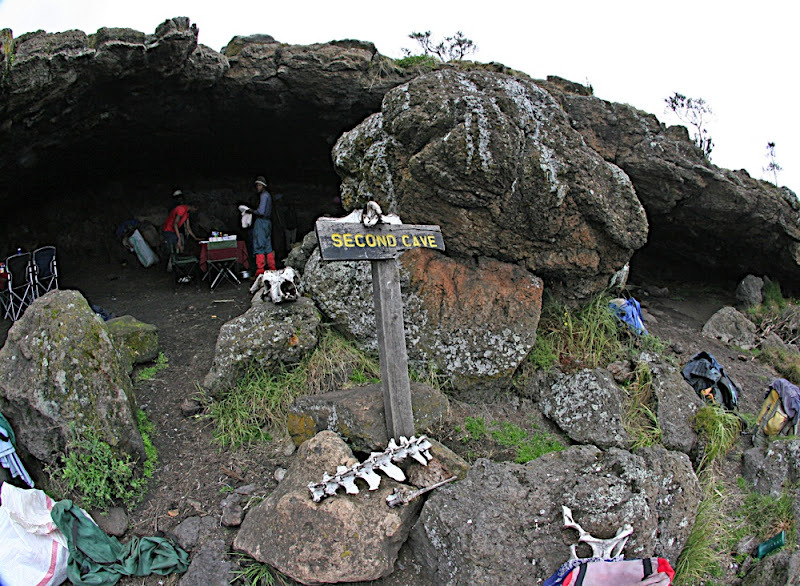 Here we start, 2200 m down from Uhuru Peak, at Horombo on the Marangu route -- often named "the Coca-Cola route" because it's full, it's supposed to be the easiest, and it has huts all the way. And GSM connectivity at the huts. By contrast, Rongai or "the Nature route" had none of the above. This final day provided lots of nice views, a descent of 2000 m and a 21 km long walk. 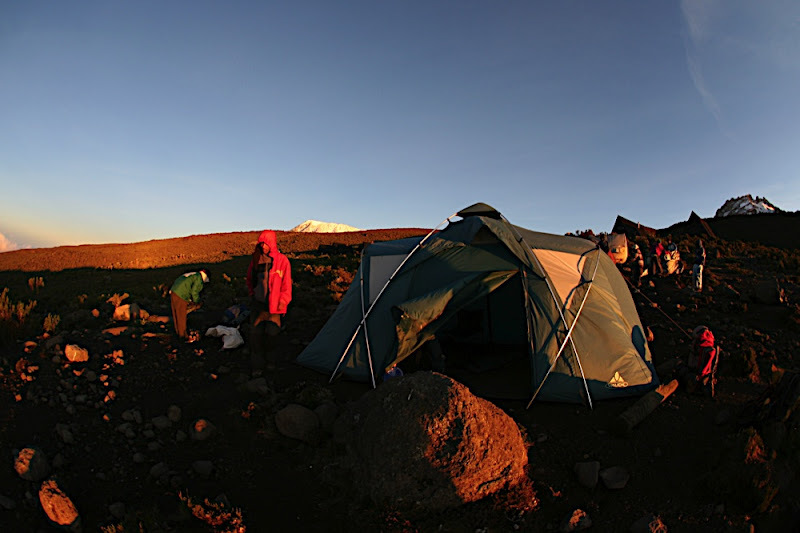 The sunrises were beautiful everywhere, and on the Marangu route, they were even more visible. As opposed to day four, the summit was covered in snow day six. Strange botanic experiences were on offer. But also, familiar botanic experiences. This bush looks like what I call "ljung" and find on the islands between Finland and Sweden. The climbing had by now deteriorated into Nordic Walking. We had plenty of porters. Although the final day of descent, we were still above the clouds. Kilimanjaro looked beautiful also from the by now longer distance. There was a fire here, at the end of 2008 -- about 2-3 months ago. Supposedly it started because of natural causes. Also my son Alexander has mutated into a Nordic Walker. And 21 km is a fair distance to walk. Only the last third or so is rain forest. To the left, Kilimanjaro. To the right, Mawenzi, also over 5000 m.
No, we don't have anything similar in Finland. Ah, the rain forest! Very different climatic / botanic zones in quite a compact area. I tested an alternate method of descent, for people who don't wish to walk. I preferred the walking, and luckily didn't have to resort to wheels. This is just a few short kilometres from the open areas a couple of pictures earlier. This is a monument to Hans Meyer, who climbed "Kaiser Wilhelm-Spitze", as it then was called, in 1889. 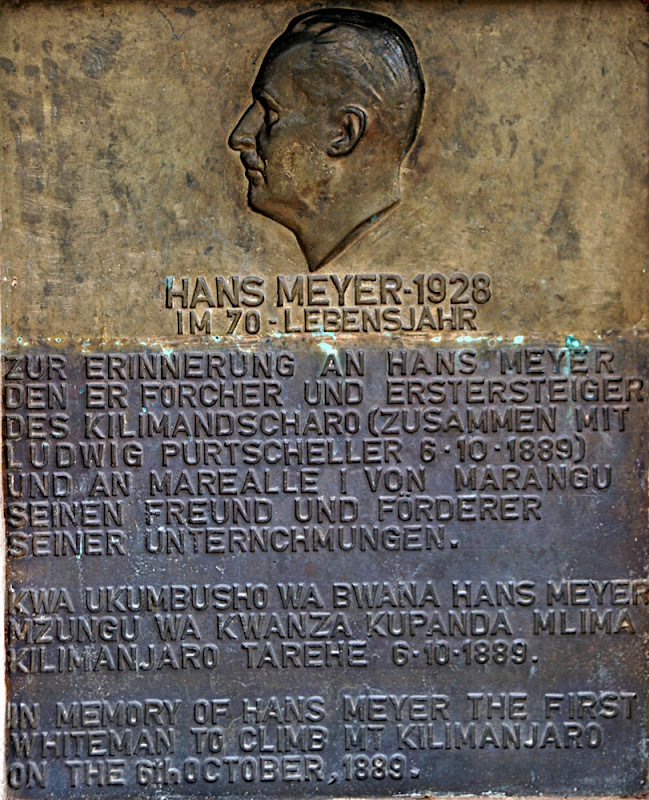 Hans Meyer was "the first whiteman to climb Mt Kilimanjaro", my son noted with astonishment. This sign should rather have been at the start of my pictures, but we only descended using the Marangu route. Our ascent was through Rongai. The reward of the 21 km of walking during the last day? 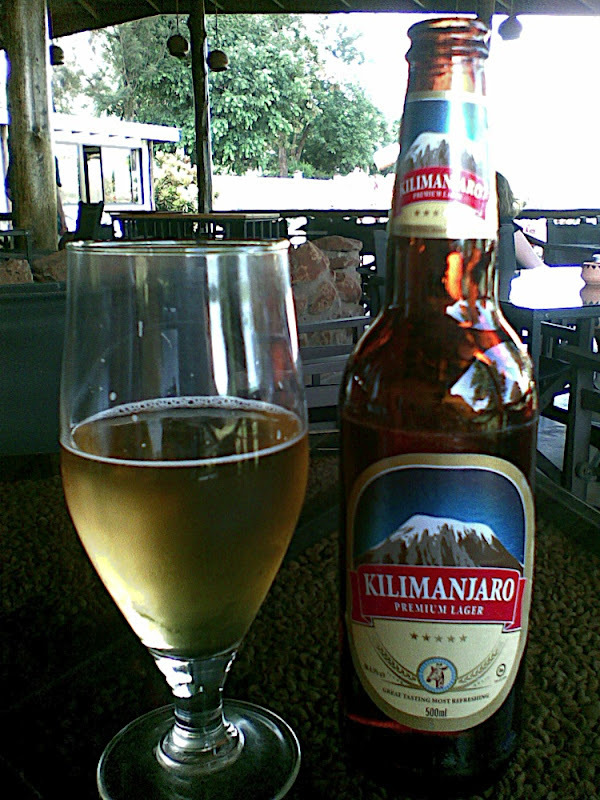 A cold bottle of Kilimanjaro beer!